FLORIDA -- A woman plead 'no contest' and was adjudicated guilty on August 24th of two misdemeanor charges in a 2008 animal abuse case, according to the State Attorney's Office. 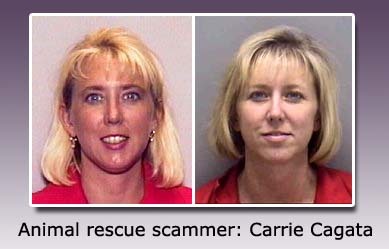 Judge Volz sentenced Carrie Cagata to two years probation, $190 court costs, $100 cost of prosecution, and 400 hours of community service. On September 19th 2008, a search warrant was issued for property Cagata rented on Jackson Road. A deputy described the scene: “The floors were partially covered with urine and feces. There was feces in the bathtub. The stench was such that I could barely stand to be in the house. In the laundry room, I found a terrier. The dog was so thin that I could not only count ribs but vertebrae as well. The dog’s gums were very pale, almost white. “There was a shed behind the house containing numerous cats. I did not enter this building because of the stench. I could see through the front door numerous cats in cages and crates. The litter boxes were overflowing. I viewed pictures taken inside by Animal Control Officers and could see that most of the water bowls were not only empty, but contained dust and dirt. ‘Cagata’ was written on the top of one of the crates. 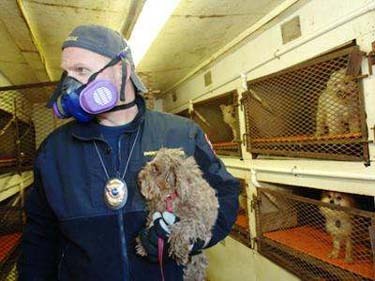 Several animals were taken that day from Cagata's organization "My Best Friend, Inc." The animals were found living in extremely unsanitary conditions. Cagata must now perform 400 hours of community service and cannot have contact with any animals during her probation period other than the pets she currently owns. She also is not allowed contact with any of her former employees. Cagata originally faced 120 charges of animal cruelty and abandonment. The State went after her on two other charges they could prove. Cagata has a court appearance Tuesday at 3:00 p.m. to go over her probation supervision instructions. 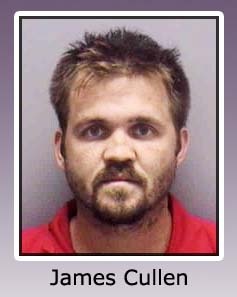 James Cullen, the caretaker of the property, previously plead guilty to charges in this case on March 24, 2009. He received 300 days in jail, 12 months probation, and over $1,900 in fines and court costs. 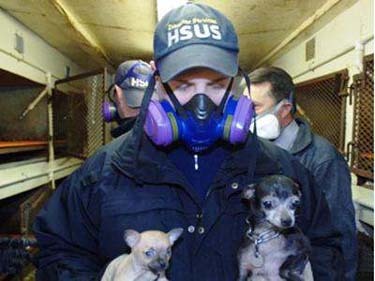 In October 2008, Lee County Domestic Animal Services was awarded custody of the animals confiscated in the case. Despite the medical conditions of many of the pets, most were able to be adopted into new homes or were claimed their legal owners. Anyone who can offer assistance by fostering pets in need until they are ready for adoption may call 533-7387 for information. 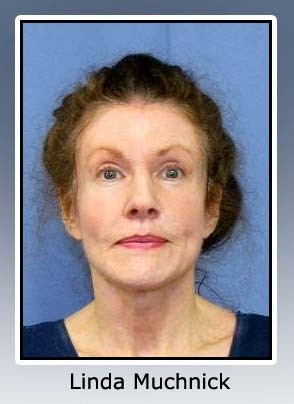 PENNSYLVANIA -- When police in Towamencin Township, Pennsylvania received a tip from a veterinarian that a woman was about to off herself and her large collection of pets, they arrived at the home of Linda Muchnick to find a nasty scene. The stench was overwhelming. Her 29 cats were locked in a bedroom where they had apparently been fed rat poison. Her pit bull was also sick. And Muchnick was unconscious. Though all but one cat appears to have survived, the hospitalized Muchnick is expected to be arraigned on animal cruelty charges. According to the Allentown Morning Call, she wanted to kill herself due to financial pressures, which probably weren’t helped by trying to care for 30 pets. Florida: Jose Posada, 59, arrested and charged with multiple counts of animal cruelty after animals seized. Two horses didn't survive. FLORIDA -- The Miramar ranch owner who is accused of letting a half-dozen horses become so malnourished that two had to be euthanized was busted over the weekend in Miami. Jose Winston Posada was arrested at Miami International Airport Saturday as he re-entered the country on a flight from Colombia, according to police. Posada, 59 was charged with seven counts of animal cruelty after authorities found six horses and one mule extremely underfed on his property in the 3400 block of SW 124th Ave on Aug. 21. One horse had to be put down at the residence, and a second mare had to be euthanized after the South Florida SPCA couldn't nurse her back to health. The discovery was made just days after 11 underfed horses were found at a southwest Miami-Dade pasture at 168th Street and Southwest 192nd Ave.
TENNESSEE -- An animal control employee describes herself as lucky to be alive, after a pit bull attacked her Thursday. The incident happened on North Belmont Street in Johnson City at around noon. Johnson City Police called Washington County/Johnson City Animal Control to request help dealing with two pit bulls who escaped their chains. 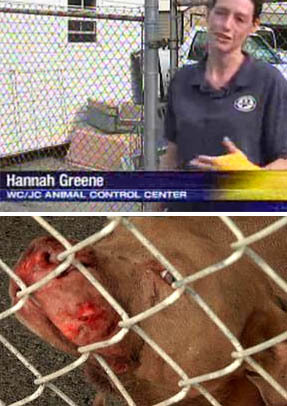 One of those dogs began fighting with another dog still in a kennel, and when Hannah Greene, Kennel Master at Animal Control, tried to intervene, the dog turned on her, ripping into her hand. A Johnson City Police Officer who accompanies Greene to the house, shot the dog. The other two were taken to the Animal Control shelter. Washington County/Johnson City Animal Control Director Debbie Dobbs said they have been to property on North Belmont Street in Johnson City before. Dobbs said property owner Brandon Scott was charged with animal neglect in November. 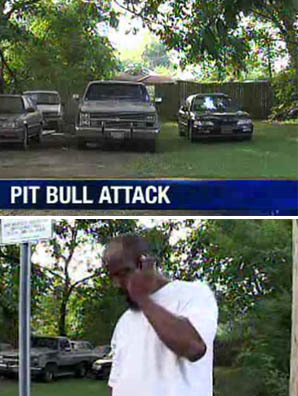 "This person is a known pit bull breeder in the area, we have had problems before out of this person," said Dobbs. Dobbs said she found signs of previous scaring on the pit bulls recovered from the property. "That would indicate they've been at each other before or been fought," said Dobbs. Scott told 11 Connects he does not breed the dogs to be fought, instead, he said he sells them as pets. 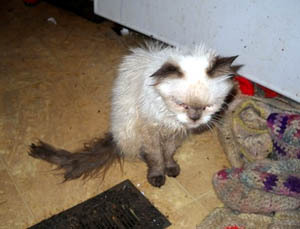 OREGON -- A 51-year-old woman has been charged with animal neglect after authorities seized 45 cats from her home in Albany. Linn County Sheriff Tim Mueller says deputies and the SafeHaven Humane Society raided the home of Jean Primrose (aka Jean Marie Primrose) on Saturday and found unsanitary conditions and a large number of cats that needed immediate medical care. He says officials found cat urine and feces on furniture, walls, clothing and on Primrose and her two elderly parents who also live there. 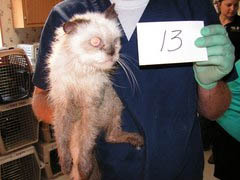 A number of cats was suffering from urine scalding, ear and eye infections, malnourishment and dehydration. Primrose has been charged with 45 counts of second-degree animal neglect and has been released from custody. She relinquished ownership of the animals and the cats have been taken by the society for medical care and adoption placement. OHIO -- Gone with the two dead rabbits were the devious grin and swath of purple bangs from a Facebook photo that has riled animal advocates. Instead, 20-year-old Liz Carlisle dressed in conservative gray and remained stone-faced amid a throng of protesters who confronted the former pet store worker as she made her first court appearance Monday to answer animal cruelty charges. Carlisle pleaded not guilty to the two misdemeanor charges in Akron Municipal Court. She has a pretrial hearing before Judge Stephen Fallis on Sept. 3. Ron Gatts, an Akron attorney representing Carlisle, said the public is unaware of the entire story behind the photograph that prompted the charges against the Ravenna woman. 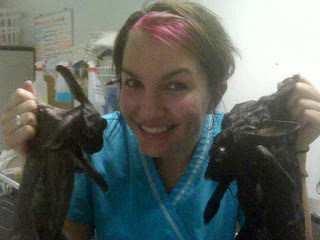 The image, posted on Carlisle's Facebook page, appears to show her holding a soaked and drowned small black rabbit in each hand. Carlisle is seen smiling in the photo and a comment on the social Internet site says the animals were euthanized through drowning. ''She regrets this. She regrets all of this,'' Gatts said. Still, he said, the public will take a different look at the former Petland store worker once the facts are aired. Gatts would not comment about Carlisle's defense, but he hinted that Petland store policy might come into play. The franchise in Chapel Hill Mall closed after Carlisle's arrest. ''What Petland does is up to Petland,'' he said. ''I think she's been singled out and, yeah, I think she's going to be the scapegoat. ''I think that everybody's going to get an idea of what really happened and when they do, they're not going to be coming down so hard'' on Carlisle. On Monday, however, Carlisle had to endure the chants of protesters, who carried signs outside the Harold K. Stubbs Justice Center before, during and after the hearing. ''Justice 4 the defenseless,'' ''Bunny killers belong behind bars'' and ''Justice for drowned rabbits'' were among the signs protesters carried. At one point, members of Carlisle's family struggled with a protester who boarded an elevator with them. Elinore Israel of Akron Voices for Animals was among the protesters. She said Carlisle's guilt is beyond question based on her Facebook entry alone. NEBRASKA -- A Lakeland couple will be formally charged next week for hoarding 41 cats in their home. Clifford M. Gray and Juanita K. Gray will be arraigned in District Court at 10 a.m. on Tuesday, Aug. 25 on charges of felonious cruelty to animals, a class four felony. The charge carries a maximum of five years imprisonment, a $10,000 fine, or both. The cats, most of them chronically ill, were discovered at the Grays' Lakeland home on July 17 when Washington County Sheriff's deputies served a health inspection warrant. All but four of the cats were euthanized by the Nebraska Humane Society due to upper respiratory infections and poor health. The Grays' home was declared uninhabitable and condemned. Neighbors had previously complained of a large number of cats in the neighborhood, and the smell coming from the home. One of the four surviving cats was put down a few weeks after the others because it bit workers. The remaining survivors are kittens and are currently fostered out. Pam Wiese of the Nebraska Humane Society said the kittens must gain more weight before they can be adopted. NORTH CAROLINA -- A District Court judge on Thursday found a Wayne County woman guilty of a dozen misdemeanor charges of animal cruelty. County animal control officers seized 283 dogs from Thornton's Kennel (Wayne County, NC) in February. Many of the animals were emaciated, had untreated cuts and were housed in filthy conditions, authorities said. Kennel owner Virginia Thornton, of Mount Olive, received two 45-month suspended jail sentences and must serve 36 months on probation, pay a $2,000 fine and perform 48 hours of community service. Under the terms of her probation, she is banned from breeding animals or owning any except for the two dogs she currently has. Testifying on behalf of the state, Dr. Kelli Ferris, an expert witness from North Carolina State University's College of Veterinary Medicine, said Thursday that she observed chain collars on the dogs at the time of their rescue that had been on the animals for a prolonged period. "It shows a complete lack of understanding by this breeder," she said, adding that she believes the animals had been deprived of necessary medical care. 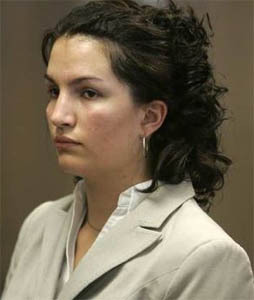 Thornton had no comment over the course of the two-day trial. 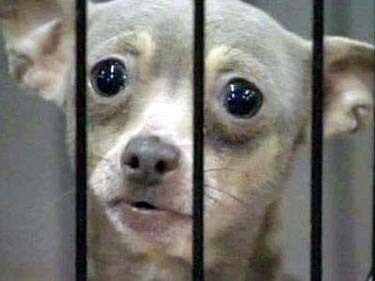 NORTH CAROLINA -- As the former owner of a North Carolina puppy mill is appearing in court today charged with 12 counts of animal cruelty, the dogs she is accused of abusing are thriving in the loving care of their new families. Nonie, Turtle and Chloe were all used to breed the puppies sold by Thornton's Kennels in Wayne County, N.C. Their suffering ended in February when The Humane Society of the United States and Wayne County Animal Control rescued almost 300 dogs from deplorable conditions. Many suffered from serious medical ailments including embedded chain collars, ringworm and eye and skin infections. Six months later, most of these dogs have been adopted into permanent homes that will provide them with the love, respect and companionship they deserve. 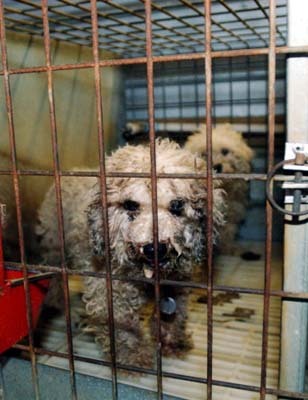 Nonie (labeled "No Name" on her paper work) was a heavily matted and malnourished "breeder" Maltese who lived in one of the many filthy, cold, cramped cages in the puppy mill for the first years of her life. Due to the large number of animals rescued, Nonie was one of many who were moved to shelters in other states to avoid overcrowding local agencies. She was transported to the SPCA of Tampa Bay, Fla. where her new life began. Soon after, a nice couple came to meet her. Nonie hobbled over to them and fell into their arms — it was love at first sight. Nonie was in poor condition. She was diagnosed with dislocated knees and her paws were still stained and burned from years of standing in her own urine. She had also lost a lot of fur. Today, Nonie is a new dog. Her adopter, Marsha Stevens-Pino, reports that Nonie's fur has grown back white and fluffy and she looks taller now that her dislocated knees have been treated. Nonie has learned what treats are, how to eat from people's hands and now knows what it means to go for a walk. Her favorite activity however, seems to be the simple pleasure of a good tummy rub. 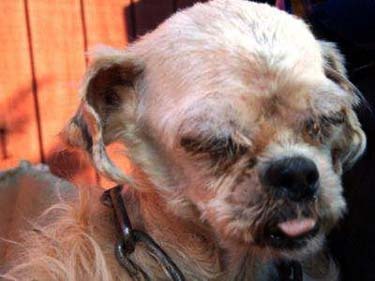 Turtle, a 13-year-old Shih Tzu who had lived his entire life in a cramped, unventilated cage, could hardly walk when he arrived at the SPCA Tampa Bay shelter. 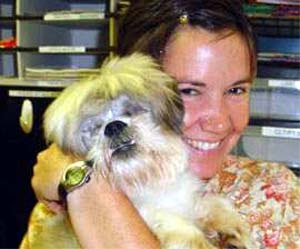 Turtle was blind and suffered from chronic pain from glaucoma. One eye was shrunken due to scarring and the other eye was so large that he could no longer blink. Turtle needed his eyes removed to stop the pain. Turtle was taken to a veterinary ophthalmologist, Dr. Thomas Miller, who was so touched by Turtle's plight that he performed the surgery at no cost. There, Turtle caught the attention of a technician, Tracy Gould. Turtle would lick everyone's chins as if to say "thank you for taking the time to pick me up." After a lot of Turtle's convincing chin licks and tail wags, Gould knew he was meant to join her family. Despite losing his eyes and the trauma of his past, Turtle seems to have adjusted perfectly with the family's two other dogs, two cats and rabbit. He has figured out what toys are and how to play with them and is learning how to walk on a leash, but still prefers to be carried. Turtle endured 13 years of neglect, but has finally found peace and a loving family to call his own. 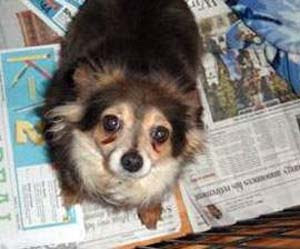 Chloe was a 1-year-old malnourished "breeder" Chihuahua who delivered two puppies several days after the raid. Because of Chloe's poor physical condition, only one puppy survived. About one week later, Chloe's milk dried up. The North Carolina rescue group that was caring for Chloe was able to find another mother dog willing to resume feeding the puppy. 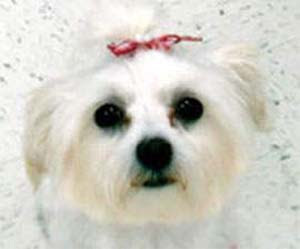 A local TV station that covered the puppy mill story featured Chloe's picture on the news. When Gina Dunwell-Rushing saw her, she knew Chloe would be the perfect addition to her family. When she met Chloe, the young Chihuahua was missing a lot of hair and was very frightened of people and everyday noises. When fed she would devour her food as if she feared it would be taken away at any moment. After months of loving care, Chloe has a beautiful, thick, curly coat of hair and has learned to trust her new family. She is still learning that she doesn't have to devour her food, as she probably had to fight for it in the puppy mill. Chloe now knows how it feels to be loved and adored and enjoys running in the grass under the sunshine — something she never experienced during her life in the puppy mill. 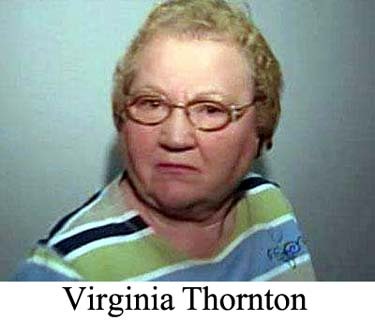 Virginia Thornton, the owner of Thornton's Kennels, is schedule to appear in Wayne County criminal court today. Representatives of The Humane Society of the United States Wilde Puppy Mill Task Force will be testifying for the prosecution in the case. SOUTH AFRICA -- Toddler René Van der Merwe, 23 months, pictured by Beeld newspaper with her parents, was caught with her face inside the jaws of a Boerboel-dog crossbreed with a Staffordshire terrier. 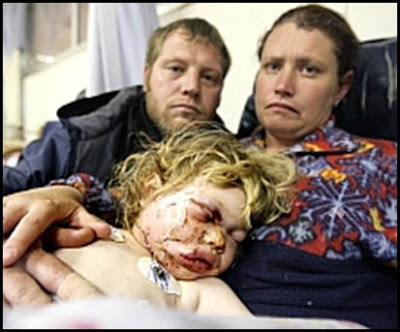 This powerful animal’s jaws had to be pried open by father Renier to get her head lose and get her rushed to hospital. The little girl’s jaw was broken by the dog’s bite and she will also need extensive plastic surgery. René was playing in a family member’s backyard in Sasolburg – the town where the coal-to-fuel plants of the SA government are located. The dog snapped his jaw around her face and the dad had to pry the jaws open to get her head from its powerful bite as the animal would not let go. Immediately after he got his child loose, Renier stabbed the dog to death: reportedly the animal had bitten other animals before and had also snapped at people’s heels, the father told Beeld newspaper. OHIO -- This photo was taken in the back room of a Petland store in Akron, Ohio, and posted on Facebook by Elizabeth Carlisle, who can be seen grinning as she holds two dead, soaking-wet rabbits by the scruff of the neck—rabbits she just drowned while on Petland's time clock. On Carlisle's Facebook page, she confirmed a friend's guess that she had drowned these two rabbits and wrote, "[T]he manager took the pic for me. [S]he reminded me that there were people outside as [I] was swearing at them to just hurry up and die but then she was so kind as to take this picture." These horrific deaths followed what was apparently an equally horrifying life for these rabbits. Other comments Carlisle posted made it clear that the rabbits were drowned after sustaining agonizing injuries when they were allowed to "attack and eat each other." The rabbits suffered from "deep wounds all over," "an eye missing," what Petland staff "suspected was a broken jaw," and paralysis from the waist down—injuries that would not have occurred had these animals been provided with proper care and supervision. Undercover investigations have revealed time and time again that companies that breed and sell animals are concerned about profits, not animals' well-being. We are urging Petland to think long and hard about what this incident makes clear: The company has no business selling any animals. To prevent future incidents like this one, please, never buy from pet stores and urge Petland at the very least to stop selling rabbits.